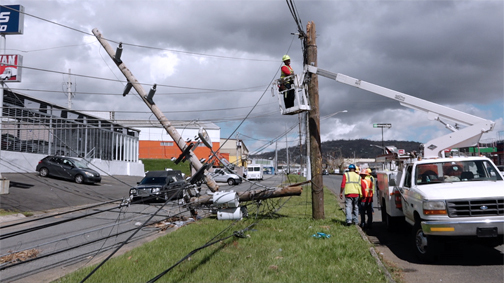 Liberty crews are working to rebuild its network throughout Puerto Rico in the wake of Hurricane María's destruction. Liberty crews are working to rebuild its network throughout Puerto Rico in the wake of Hurricane María’s destruction. Liberty Puerto Rico has made progress in the reconstruction of its fiber ring in the Western zone, completing the ring between Aguadilla and Mayaguez; and advancing in work between Mayaguez and San Germán, company officials said Tuesday. In the Southern zone, Liberty is working on fiber ring segments between Ponce and San Germán and Ponce and Santa Isabel. Brigades completed repair work on the ring that lies between Levittown and Vega Baja and on to Caguas. Another segment almost complete is Caguas to Humacao, the company confirmed. Liberty had already completed work on the ring lines that connect Hato Rey with Luquillo, Caguas and Levittown. In addition, the company is verifying equipment to speed up service reestablishment once areas are powered up, so services can be restored as soon as possible. “The main part of the job that we are doing right now may not be visible immediately to our customers, but it is crucial to reach the part of our infrastructure that goes into their homes,” said Naji Khoury, president of Liberty Puerto Rico. Liberty also announced that, in addition to its Customer Service Center in Hato Rey, the one in Luquillo is also operating from 8 a.m. to 5 p.m. The drive-thru at the Liberty Tower center is already operational. The company also reaffirmed it will give customers an automatic credit for the time they remain without service due to Hurricane María, starting on Sept. 20 to the date customers receive the company’s services again. Customers who lost service during Hurricane Irma will be able to choose which type of compensation they want once Liberty reactivates the compensation page at Mi.LibertyPR.com. Meanwhile, Liberty has continued to activate free high-speed WiFi spots. As service is restored, the company will add new WiFi spots throughout the entire island. The spots that are currently available are: Bahía Urbana in San Juan from 8 a.m. to 7 p.m., West Marine in Hato Rey from 8 a.m. to 5 p.m., the area in front of Liberty’s Customer Service Center in Luquillo which operates 24 hours a day and the Food Court at #268 Ponce de Leon Ave. in Hato Rey from 6 a.m. to 6 p.m. The company opened a new hotspot in front of the Liberty Tower Customer Service Center, 24 hours a day, with tent and chairs during hours of operation of the store, which opens from 8 a.m. to 5 p.m.
Will Wi-Fi hot spots appear on the S. Coast with line of sight to the mountains to the North to help places like Santa Isabel, Salinas and Guyama? Hey Buddy!, I found this information for you: "Liberty rebuilding fiber ring in western, southern flanks". Here is the website link: https://newsismybusiness.com/rebuilding-western-southern/. Thank you.